In my first article, the apparition of Our Lady of Knock (1879) was introduced to the readers. I pointed out that, as in the other three recent major apparitions – La Salette (1846), Lourdes (1858), and Fatima (1917) – Our Lady did not appear to the clergy. There were secrets in these three apparitions; in the case of Knock the secret is veiled in the silence of the apparition. I also presented the testimony of one of the official 15 witnesses at Knock. I plan to continue the analysis of those testimonies in the succeeding articles. 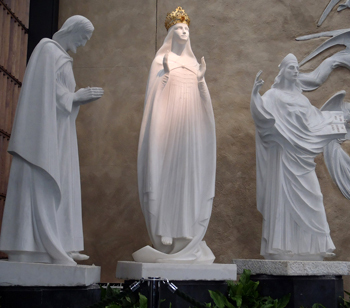 The apparition at Knock, because of the absence of a spoken or written message, is usually set aside and considered less important than La Salette, Lourdes or Fatima. But I believe that, for those who have eyes to see, Knock is as important as the other three apparitions and should be considered as one of the four major apparitions of recent history. Today I will compare the apparition of Our Lady of Knock with that of Our Lady of La Salette. On a lone mountainside near La Salette, France, on the eve of Our Lady of Sorrows, during the month of the Holy Cross, on the beautiful day of September 19, 1846, Our Lady appeared to two peasant shepherd children named Melanie Calvat and Maximin Giraud. She wept almost for the duration of the apparition, sometimes burying her tear-covered face in her own hands. Melanie would lament that she could not console the beautiful Lady. The Church will be in eclipse, the world will be in dismay. As for the affinities, when we compare Knock and La Salette one notices that, besides the presence of secrets and the absence of any clergy, there is another common trait: Our Lady is not appearing inside any Church structure. The four recent apparitions do not take place inside a church, a convent, a monastery or the like. The apparition of La Salette is on a mountainside, Lourdes is in a grotto, Knock is deliberately and conspicuously just outside of a church that is a few feet away, and Fatima takes place in the fields at the Cova da Iria. As with Knock, Our Lady of La Salette would appear only once; at Lourdes and Fatima she appeared to the seers multiple times. Both Knock and La Salette had been suffering from potato famines that Our Lady at La Salette said was a consequence of man’s sins, especially the profanation of her Son’s name and not keeping holy Sunday, the Lord’s day. As for the contrasts, at Knock not once would Our Lady look down at the people watching before her or change her expression, and that evening the only tears were those from the sky, rain. In fact, in some ways, the contrast between the two apparitions could not have been greater. At La Salette (1846), it was a beautiful sunny day in the French Alps, but Our Lady was constantly weeping. Thirty three years later at Knock, it was the opposite. It was an ominously dark, rainy and gloomy day, but Our Lady shed no tears within a bright, dry, splendorous sphere of light. The witnesses saw in her eyes only the fixed, resolute gaze upward of one in a state of profound prayer. Of course, there is also the obvious contrast between the spoken message of La Salette and the silent message of Knock. I have already mentioned that I believe the silence at Knock could be seen as a form of secret. One could also ask whether or not the silence of the Knock apparition is a consequence of an infidelity. Did the actions of a person or persons, especially if they are members of the Catholic Hierarchy, cause this to be a silent apparition? Did some betrayal cause Divine Providence to “say” in 1879 something analogous to what Our Lord said to the “wicked and adulterous generation” of His time: “A sign shall not be given” (Mt 16:4)? It could be noted that the saintly Pope Pius IX began his reign in June 1846, just a few months before the apparition of La Salette and died in 1878, the year before the apparition at Knock. He was succeeded by the liberal pontificate of Leo XIII: the reigning Pope during the silent apparition of Our Lady of Knock. Let me observe that during the entire pontificate of Leo XIII the true Catholics, the Ultramontanes, were obliged to be silent about those enemies – liberal Catholics – who had been condemned and removed from the scene by Pius IX. We may say that with Leo XIII the militancy of the Church was silenced, that she entered a dark, long and rainy night. Likewise, tolerance toward the errors of the Revolution was exalted, and the Revolution entered a sunny day that prepared Modernism, Progressivism and Vatican II. Doesn’t the silence of Knock have a relation to this papal silence? Speaking of infidelity, there is another point of contrast between the two apparitions: La Salette received from the Vatican a kind of “gag order”… Knock did not. In 1915, a year after the death of Pope St. Pius X, under the more compromising reign of Pope Benedict XV, there was a decree issued from the Vatican forbidding public commentaries on the secret messages of La Salette. This decree seems to be still in effect even in the present-day scandalous reign of Francis I. We are allowed to have the text, read it and pass it on to friends. But we may not publicly comment on the secret messages of La Salette. So, we see that a type of silence was placed upon the apparition at La Salette. Perhaps Our Lady, Queen of Prophets, had this future event in mind when she remained silent at Knock. It would be difficult, even absurd, to try to silence a silent message. 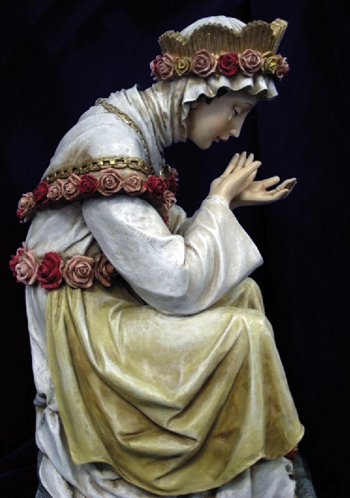 At La Salette, after Our Lady said, “Well, my children, you will make this known to all my people,” she rose to leave the children, paused and looked in silence toward the southeast, toward Rome. 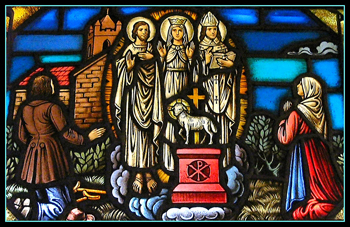 At Knock, we see that, from the south gable, Our Lady seems once again to be looking silently toward the southeast, toward Rome - toward Rome and toward La Salette, since both lie in the same direction from Knock. And as we shall see in the next article, on the very same day as the miraculous apparition of Our Lady of Knock, August 21, 1879, there was something very significant and important also happening in La Salette. I am brother of Mary Byrne, who has given her evidence already. I live near the chapel of Knock. My age is 20 years. On the occasion when my sister came at about eight o’clock on the evening of August 21 into our house, she exclaimed: “Come, Dominick, and see the image of the Blessed Virgin as she has appeared to us down at the chapel.” I said, “‘What image?” And then she told me, as she has already described it for Your Reverence in her testimony. She told me all she was after seeing. I then went with her, and by this time some 10 or 12 people had collected around the place, namely, around the ditch or wall fronting the gable where the vision was being seen, and to the south of the schoolhouse. Then I beheld the three likenesses or figures that have been already described – the Blessed Virgin, St. Joseph, St. John - as my sister called the Bishop, who was like one preaching, with his hands raised towards the shoulder, and the forefinger and middle finger pointedly set; the other two fingers compressed by the thumb; in his left he held a book. He was so turned that he looked half towards the altar and half towards the people. The eyes of the images could be seen; they were like figures, in as much as they did not speak I was filled with wonder at the sight I saw. I was so affected that I shed tears. I continued looking on for fully an hour, and then I went away to visit Mrs. Campbell, who was in a dying state. When we returned the vision had disappeared.